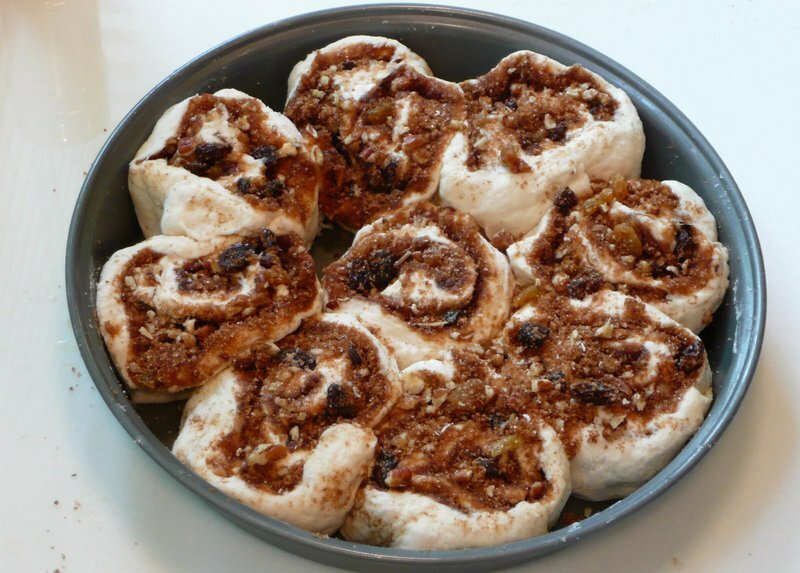 Perhaps I have my timeline wrong because now that I think about it, these may have been New Year’s Eve breakfast cinnamon rolls. Nonetheless, we started our morning with a pan of cinnamon rolls that were mighty tasty, especially with a tangy orange zest and buttermilk icing. My great-grandmother, a woman of stout German heritage, made cinnamon rolls regularly. These were yeast rolls which required more time and advance planning. I’m quite keen on a recipe from Cooks Illustrated that uses as its base a baking powder biscuit dough. You mix the dough, roll it out, add the topping then roll it up, cut it and bake it. Easy. The ingredient for this recipe are pretty simple. The cinnamon-sugar filling is 5.25 oz of brown sugar, 1.75 oz of granulated sugar, 2 teaspoons cinnamon, 1/8 teaspoon each ground cloves and salt, and 1 tablespoon of melted butter. You can modify the sugar and spices a bit if you would like to achieve a different flavor profile or level of sweetness. 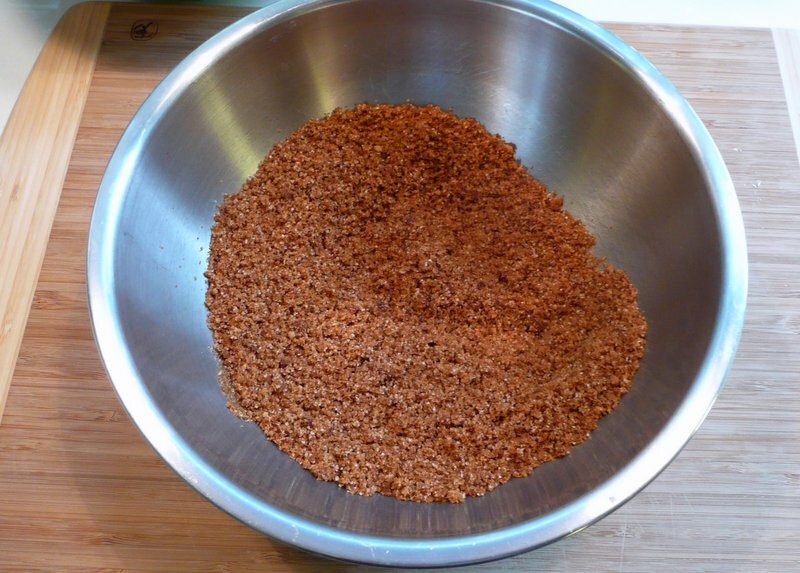 For example, you could add some nutmeg or cut back on the sugar a little. 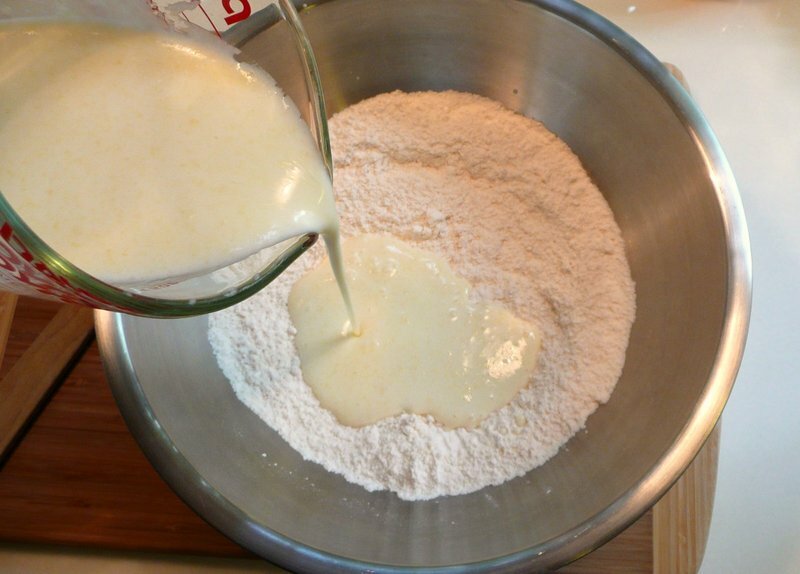 The biscuit dough is 12.5 oz all-purpose flour, 2 tablespoons granulated sugar, 1.25 teaspoons baking powder, 0.5 teaspoons baking soda, 0.5 teaspoon salt, 1.25 cups buttermilk and 6 tablespoons melted unsalted butter. Mix the sugar and spices together and then add the one tablespoon butter, stirring until it forms the consistency of wet sand. 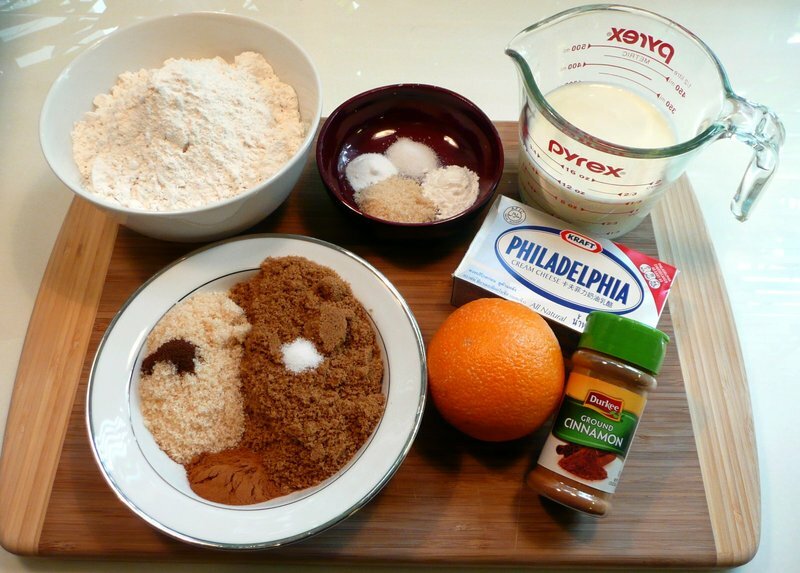 Mix the dry ingredients for the dough together. Pour 2 tablespoons of the melted butter into the buttermilk, whisking to distribute the butter into little drops throughout the buttermilk. Pour this liquid mixture into the dry ingredients. Stir together until just combined. The dough will be wet and tacky. 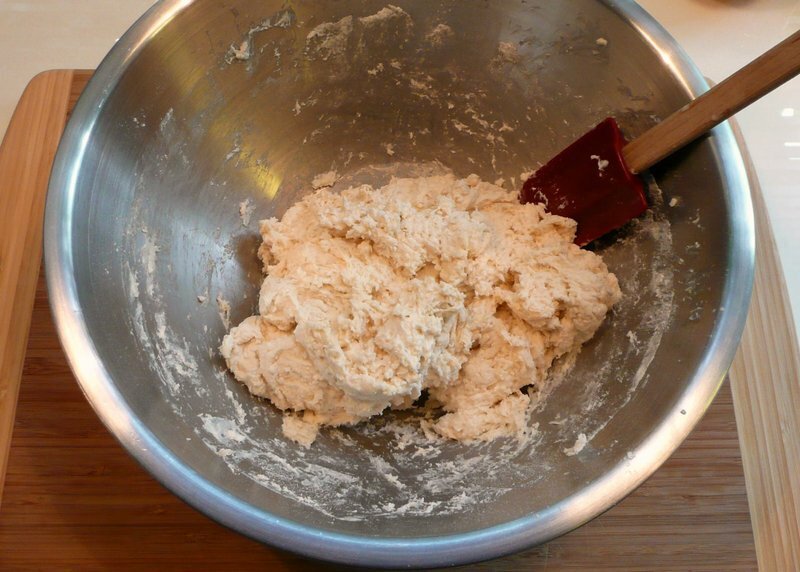 Turn the dough onto a floured board and knead just a few times until it becomes smooth and is no longer shaggy. 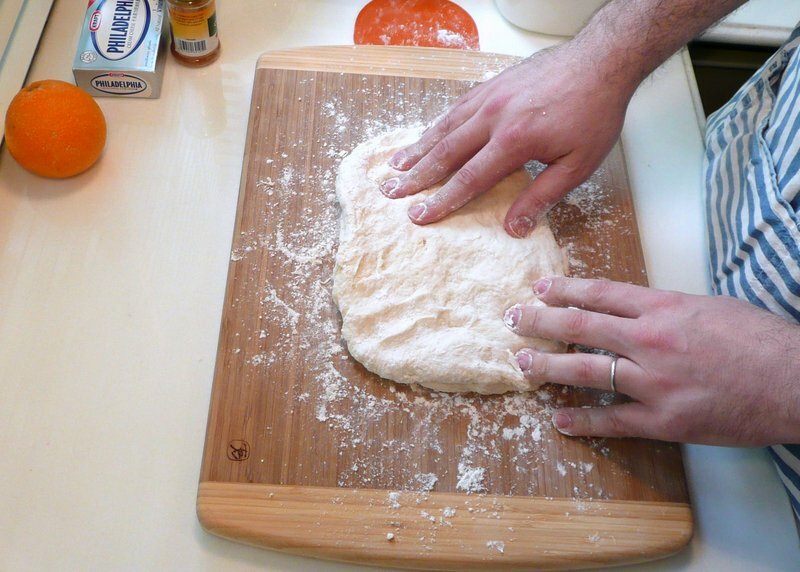 Using your hands, pat the dough into a 12 by 9 inch rectangle. 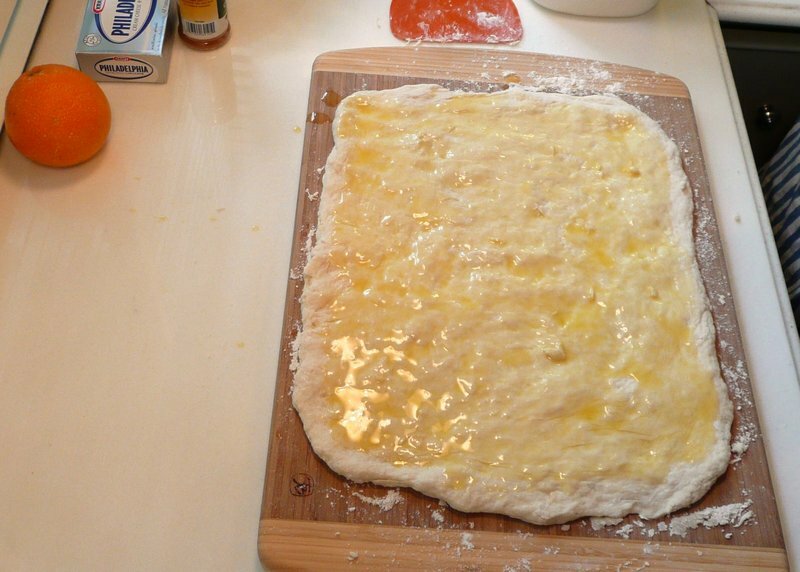 Brush the remaining butter onto the dough leaving a small gap at the edges. 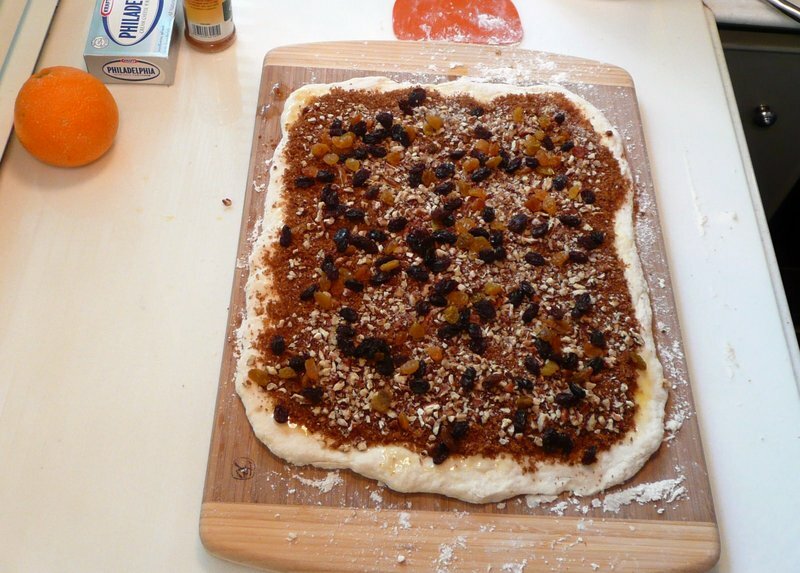 Evenly sprinkle the cinnamon-sugar mixture across the dough, leaving a border around the edge. You can use less than the entire amount of the mixture if you don’t want the rolls to be as sweet. 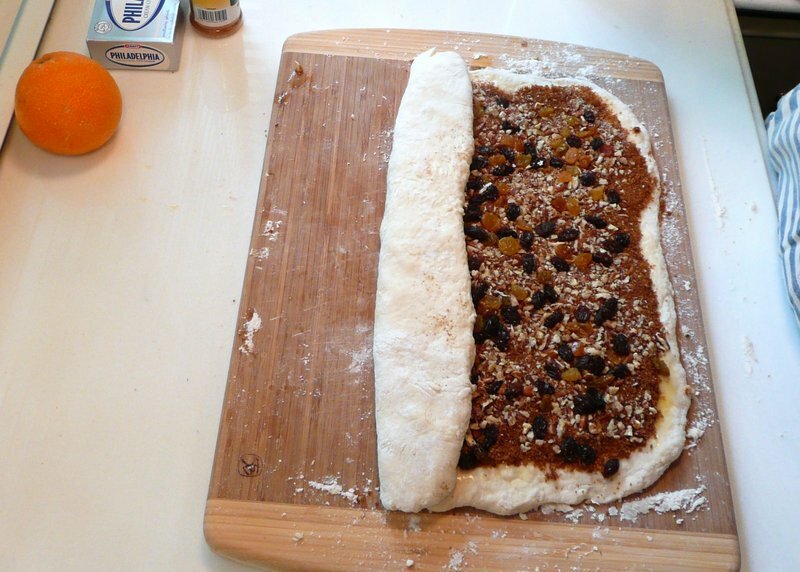 You can also add chopped nuts and raisins or other dried fruit at this point. I used pecans and black and golden raisins. Working with a bench scraper or spatula, start rolling the dough along the long side, pressing down to make the roll pretty tight. This helps hold the filling in place. 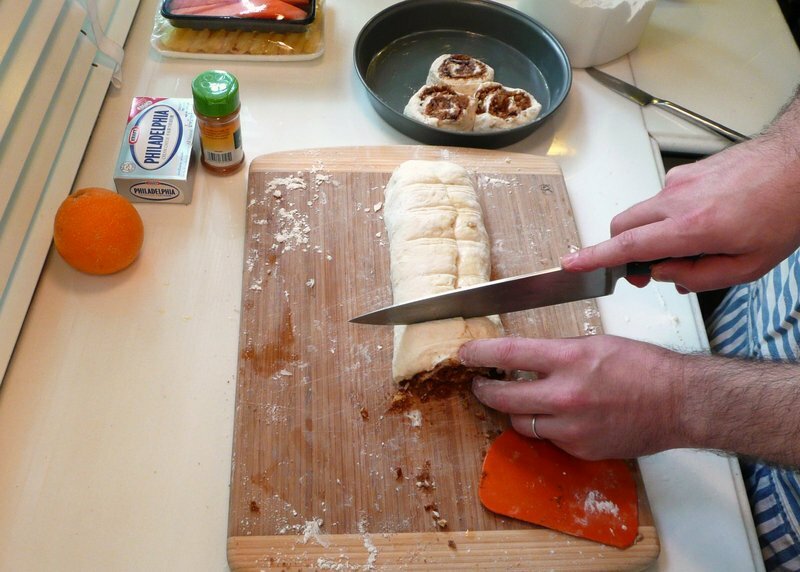 As you get to the final edge, brush a little more melted butter along the edge to help it hold firmly. Pinch the edges shut and gently smooth the log so it is uniform in size. Cut the log into nine equally sized slices. Carefully place each slice in a buttered nonstick cake pan. Place the first slice in the center and distribute the remaining slices around the first one like flower petals. You can brush the tops of the rolls with any remaining butter and sprinkle on any leftover filling or filling that fell out on the cutting board. Bake in a preheated 425 F oven for about 25 minutes or until edge are golden brown. After loosening the edges with a spatula and allowing to rest for two or three minutes, slide onto a greased cooling rack without separating. I found it easier, though, to invert them onto a plate and then invert them again onto a second plate or serving platter. Otherwise the buns wanted to fall apart. Wait five more minutes before icing. While the rolls are baking, prepare a cream cheese icing. 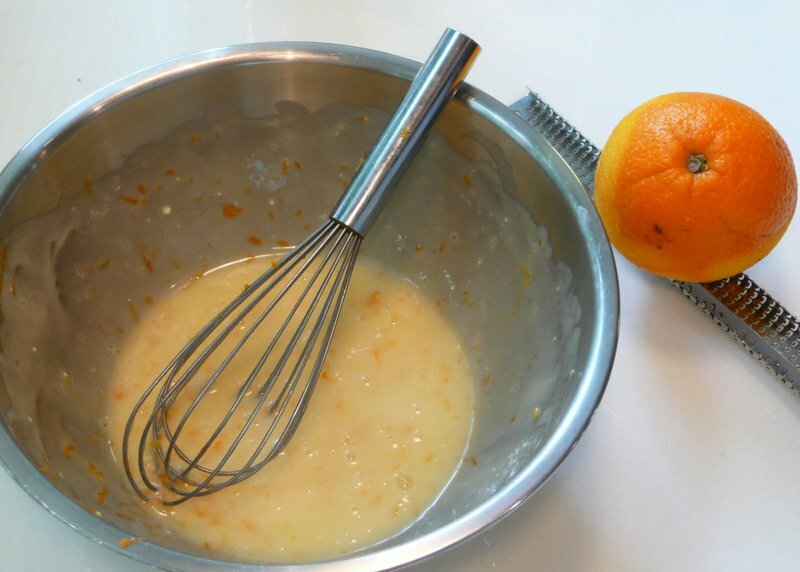 The icing is 2 tablespoons of softened cream cheese, 2 tablespoons buttermilk, some orange zest and 4 oz confectioner’s sugar, whisked together. Drizzle the icing onto the rolls, as much or as little as you desire. These are best eaten while warm but they tasted pretty good upon reheating later in the day, too. The finished product! Beautiful, isn’t it? With some fresh fruit it makes for a pretty healthy (well, almost) start to the day. 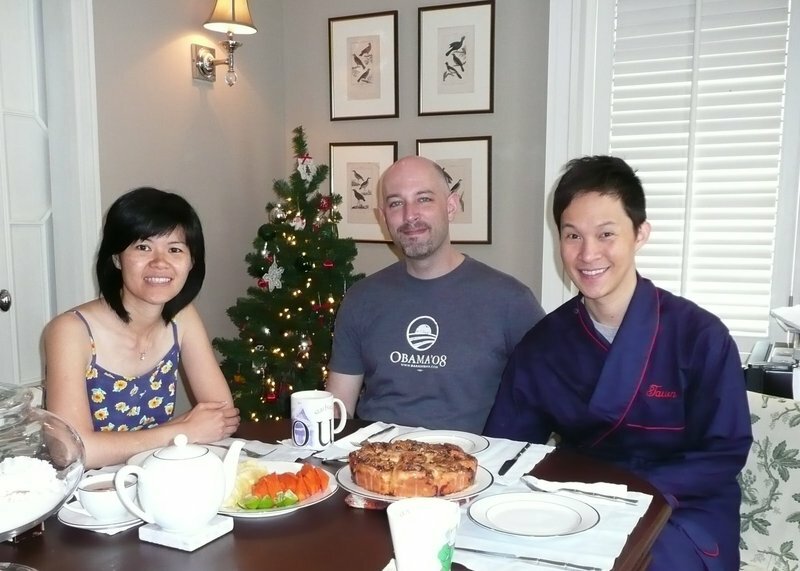 There we are with our New Year’s Eve day breakfast. A sweet end to the old year! Ok, I didn’t read the entire recipe… but the photo illustration looks amazing! I haven’t eaten anything yet (it’s 2:16PM) and am just drooling right now! I’ve to fill up with a bowl of cornflakes and a cup of frozen yogurt. Sigh! Oh my. Yum! Especially with the fruit accompaniments. I’d always wanted to do yeast baking but never have the patience for the time required. This makes a great alternative. Thanks! Looks very easy and best of all, tasty! wow, those look fantastic! i’ll have to give it a try… but first, i will have to purchase a food scale. Love Tawn’s robe!! !Nice cinnamon roll too! 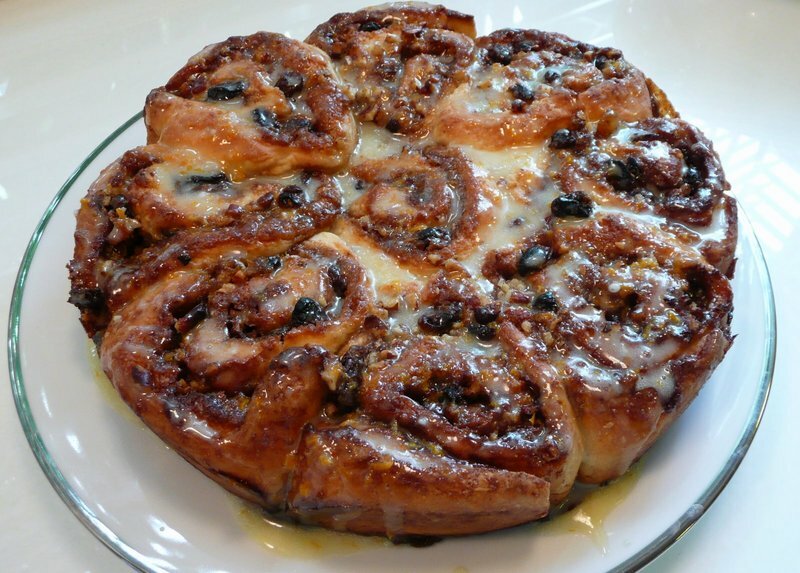 omg.. PECAN cinnamon buns with HOMEMADE ICING. can you move to ny please? :pdid i ever ask you whether you will write a cookbook one day? i feel like you should because all your pictures and explanations are really clear. once i tried writing a food preparation entry.. it was just impossible. i never knew how much luv and patience went into each entry until then XDps. oh man i’m jealous of the papayas.. they are sooo expensive here!! Love the rolls with the fresh fruit – it sort of makes it healthier. hahaha …btw – why does Tawn look so perfect when he just woke up? Looks fantastic and yummy. I do love Cooks Illustrated. What a strange coincidence — Jacquie and I were just looking at this recipe last night, and decided to make it as well. This exact recipe too, the variation recipe from Cook’s Illustrated. It’s nice to see that it turned out well; not that I’ve ever made anything from Cook’s Illustrated that hasn’t come out well.Reading the recipe last night, I’d imagined that the icing would be thicker (it sounded thicker); did you make any changes? I am wondering if I should try this recipe. I love cinnamon rolls. May be I will. What are the fresh fruits and what did you drink? Sweet (literally)! Man, that really looks delightful. I love recipes with photos!! I’m really bad at following recipes, but I think I can actually attempt this one. It’s been so long since I’ve baked something from scratch! @Roadlesstaken – Ha ha ha… punny. @lil_squirrel4ever – Recipes with photos give me a great deal more confidence. I hope you will try this. If you’d like to full, original recipe emailed to you just send me a message. @christao408 – great, thanks! now i have no excuse to try this recipe out hahaha. @kunhuo42 – No excuses Aaron! =P@Redlegsix – Ruth Ann, this is very similar to what you describe. Please try them out; you’ll find they are super-easy. Ooo, those look so good! Alright. . .stop it Chris! All this wonderful food is making me jealous! Jealous that I can’t cook like that and that I can’t be there for dinner! When is the next flight there?? I’m coming to dinner, as the “uninvited guest”. Love the photo with Martha too! Just had a conversation with some girlfriends about her. Do you know that most women loath her. . .she is such a perfect domestic diva, she makes the rest of us females look bad! I secretly peek at her website often though. Shhhhh! Don’t tell my girlfriends! @Art4ArtSake – If I can cook, you can too! As for Martha, that’s one reason I like Ina Garten a bit better. It needs to be okay to use a bag of frozen peas from times to time. i have a sweet tooth and you’re making me hungry. and it’s not even lunch time yet. wow I wish I can have breakfasts like this! I’m catching up on my blog reading…Happy new year! You sure made the whole process looked really simple! 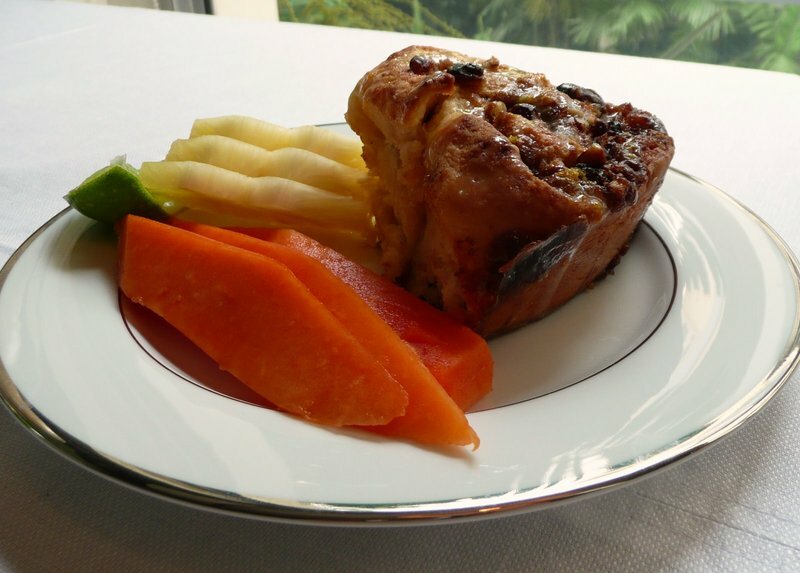 If you add some unique twists to your recipes, maybe there would not be any copyright issues? So that’s how they are made!! !You roll a big dough and slice it!